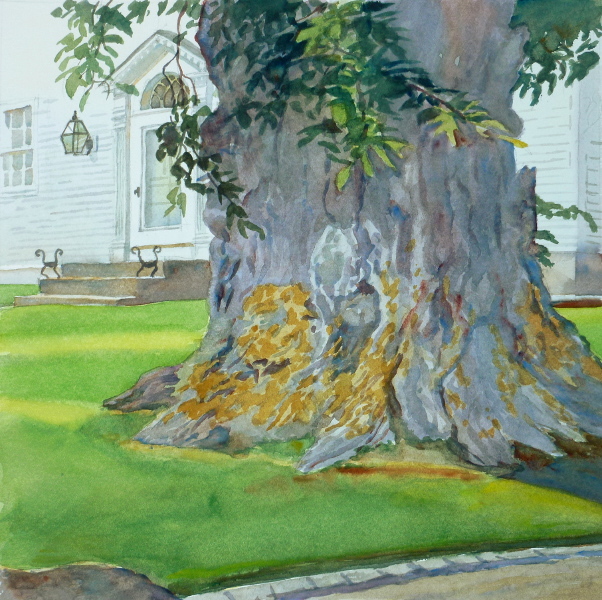 The gnarled, articulated trunk of this massive Elm tree, at the corner of Green Street and fronting a historic house, had a weighty presence suggestive of its age, perhaps beyond 200 years. The painting was started at 6pm on a Friday, with a low-slanted, glancing sunlight across the well-trimmed lawn, and casting a faint glow on the house and doorway beyond. Castine is well known for its majestic elm trees and the community prides itself on care for them, and this paint subject seemed to portray that shared sensibility. The mammoth scale of this specimen suggested that a vignette might better convey the sense of solidly occupied space at its immediate environment, and the pleasure they provide to residents and passers-by. That sense of enormity dictated the fully 60% area of the composition for depicting the subject. The organic articulation of this trunk from continued exposure to the elements, likely typical of its venerable age, conveyed its appealing ruggedness. The textures and color variables of the bark also contrasted with the relative precision of the built house behind it; though this residence was likely built from woods of sister trees once populating this area of the state. The dangling branches and leaves also provided an angular, compositional dynamic to the geometry of the house façade. The palette was a range of blues for the backlit, shaded trunk, with some vibrant oranges & ochres to depict the bark’s mold growth. The leaves were in shaded greens. A vibrant yellow, depicting the streaking light across the lawn’s grass, provided a slight horizontal axis to the tree’s and the doorway’s verticality. The driveway’s edge help ground the composition, while relating to the horizontality of the building’s siding and foundation, which wraps slightly around the trunk to the right, providing a depth of space for this view. 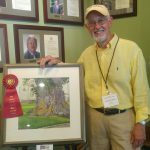 The work was finished the following Saturday morning, just in time for display in the exhibit, where it was awarded a Second Prize Ribbon and was sold to a private collector.